Francis Bacon (1561-1626), the English philosopher, statesman and jurist, is best known for developing the empiricist method which forms the basis of modern science. Bacon's writings concentrated on philosophy and judicial reform. His most significant work is the Instauratio Magna comprising two parts - The Advancement of Learning and the Novum Organum. The first part is noteworthy as the first major philosophical work published in English (1605). James Spedding (1808-81) and his co-editors arranged this fourteen-volume edition, published in London between 1857 and 1874, not in chronological order but by subject matter, so that different volumes would appeal to different audiences. The material is divided into three parts: philosophy and general literature; legal works; and letters, speeches and tracts relating to politics. 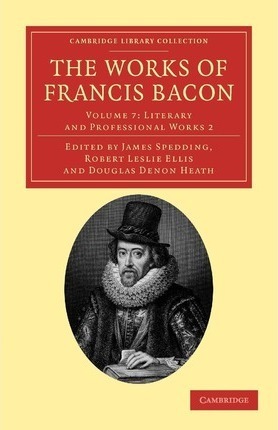 Volume 7, published in 1859, continues Bacon's literary works including his writings on religion, and contains his professional works on the law. Literary Works continued: Advertisement touching a Holy War; Of the true Greatness of Britain; Colours of Good and Evil; Letter and Discourse to Sir Henry Savill, touching Helps for the Intellectual Powers; Short Notes for Civil Conversation; Apophthegms: Editor's preface; Apophthegms new and old, as originally published in 1625; Apophthegms from the Resuscitatio, Ed. 1661; Apophthegms published by Tenison in the Baconiana; Some additional Apophthegms selected from a common-place Book of Dr. Rawley's; Spurious Apophthegms; Promus of Formularies and Elegancies; Religious Writings: Confession of Faith; Meditationes Sacrae; Prayers; Translation of certain Psalms into English Verse; Appendix to the Religious Writings - Christian Paradoxes; Professional Works: General preface to the Professional Works; Maxims of the Law; Reading on the Statute of Uses; Use of the Law; Discourse upon the Commission of Bridewell; Arguments of Law: Case of Impeachment of Waste; Lowe's Case of Tenures; Case of Revocation of Uses; Jurisdiction of the Council of the Marches; Chudleigh's Case; Case of the Post Nati of Scotland; Case De non procedendo Rege inconsulto; Preparation for the Union of Laws; Answers to Questions touching the Office of Constables; Ordinances in Chancery; Appendix; Index.